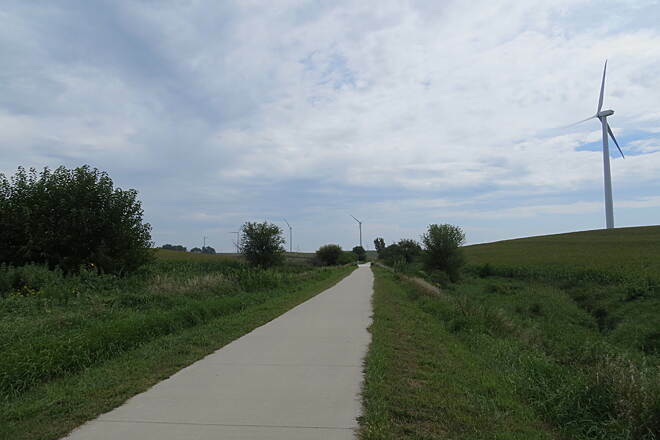 The Sauk Rail Trail offers some of the best riding in rural, west-central Iowa. 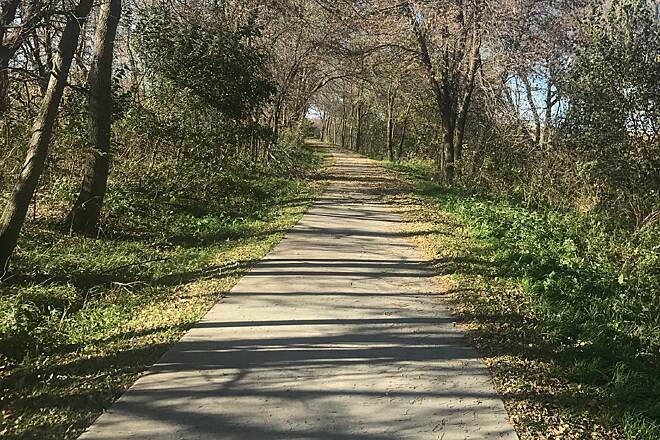 The paved 33-mile trail is capped at either end by a state park and offers a diverse mix of views and experiences in between. Friendly small towns every few miles add comfort and convenience, while frequent nods to the corridor’s railroad past add historical interest. 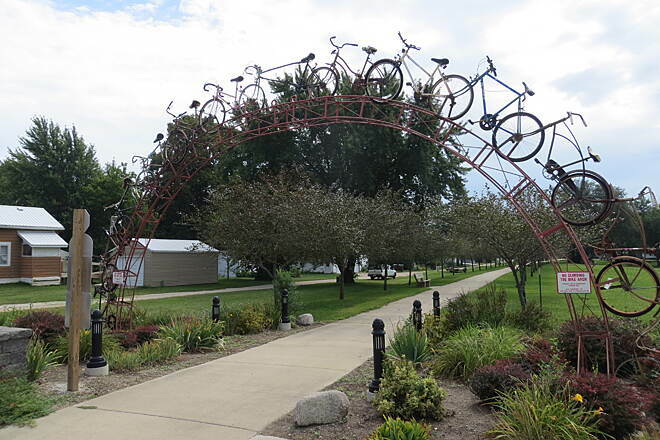 Start at the trail’s north end in Lake View to be welcomed by a unique sculpture over the trail entrance: an arch made of bicycles. 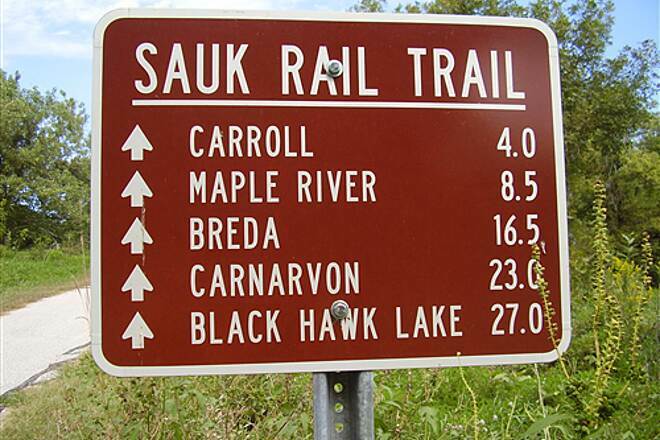 As you face the trail, you can swing your head to the left to see Black Hawk Lake just two blocks down. 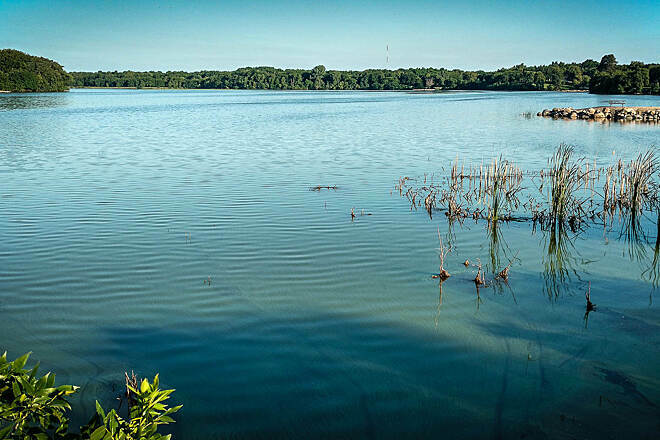 Black Hawk Lake State Park is nestled against its shoreline; the 86-acre site offers numerous amenities for camping, hiking, hunting, fishing, canoeing and kayaking, and horseback riding. A trail user fee of $2 per day is required for individuals age 18 and older; look for the self-service pay box at the trailhead. 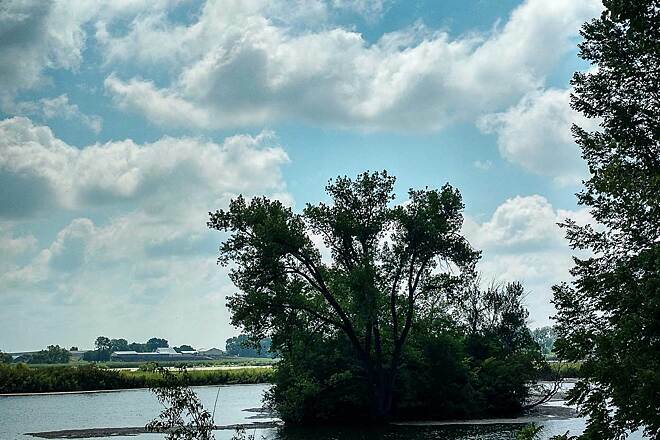 Heading south, you’re soon enveloped by trees as you travel through a wildlife area and, just a mile later, alongside Black Hawk Marsh. After about 13 miles of riding, you’ll reach Breda, home to about 500 residents. 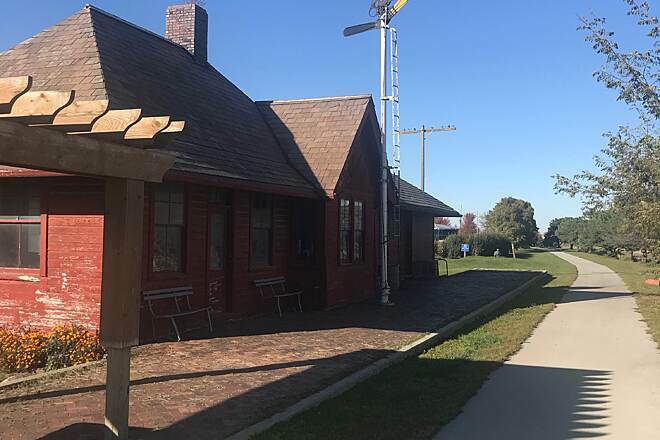 Be sure to have a look inside the community’s restored 1905 depot, which sits trailside and includes memorabilia from the Chicago & Northwestern Railroad. 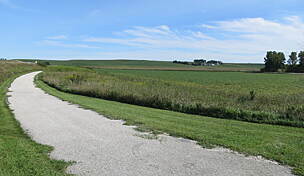 South of Breda, the vista opens up to expansive farm fields. 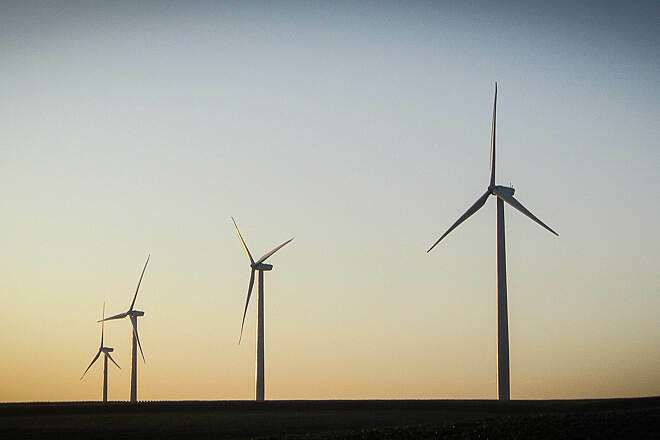 Windmills dot the horizon, and you’ll likely see cows out in the pastures. Keep your eyes open for deer and rabbits; you might catch a fleeting glimpse of them as they dive into the underbrush along the trail. 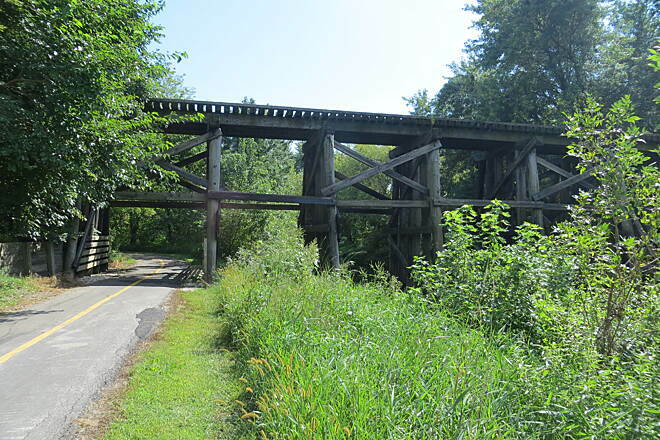 You’ll also pass under an old wooden trestle bridge on your way to Carroll. 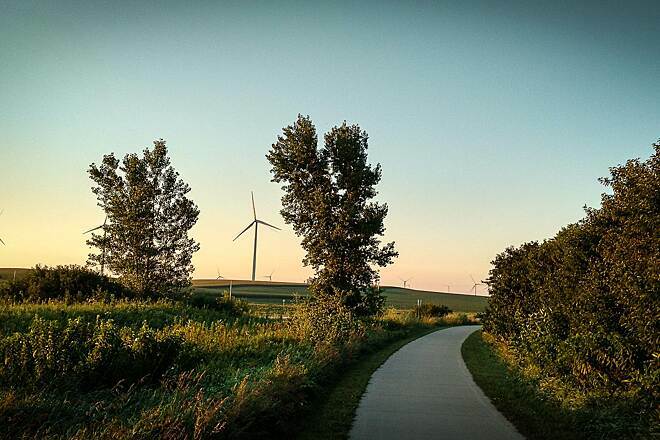 As you enter the city, the bucolic flavor of the trail gives way to a suburban atmosphere. Most of the trail thus far will have been fairly level, but as you approach the trail’s end at Swan Lake State Park, you’ll encounter a few hills. 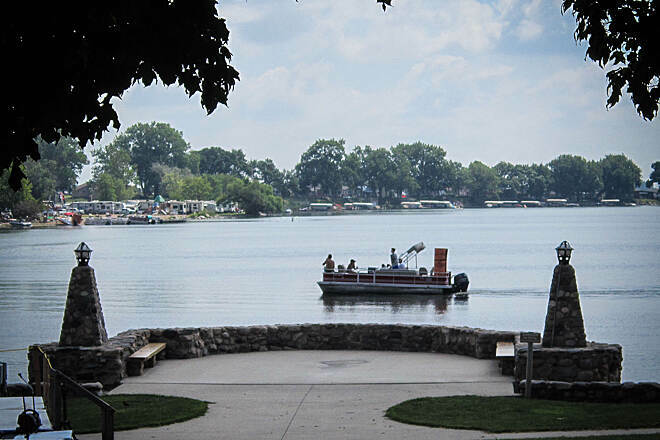 Plunk yourself down on a bench to enjoy some well-earned rest and lake views, or loop around the lake for a 3.8-mile ride. If you’re planning to stay overnight, tent and RV camping are available within the park, a 510-acre multiuse area offering a range of outdoor activities and amenities. 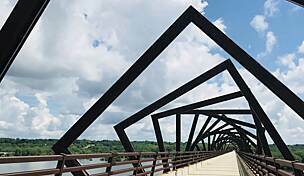 To reach the northern trailhead in Lake View from US 71 northbound, turn left (west) onto 330th St./SR 175. After 4.2 miles, turn left onto Third St. Go 0.5 mile (road turns into Crescent Park Drive), continue as the road turns into Lake St., and then take a slight left to stay on Lake St. Turn right onto Third St., and go 1.5 blocks. Parking and the trailhead with its distinctive arch are located on your left. 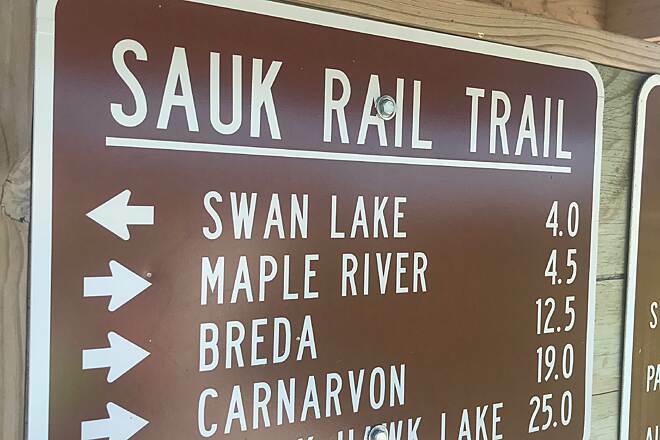 At the southern end of the trail, parking is available in Swan Lake State Park (22676 Swan Lake Drive). From US 71 northbound, turn right onto 220th St. After 1.4 miles, turn right onto the park access road, and look for parking on your right. 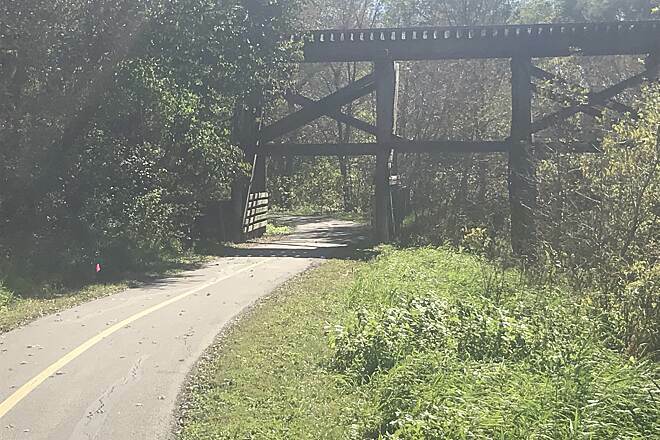 I'm from Kansas City and rode this trail on Labor Day weekend. 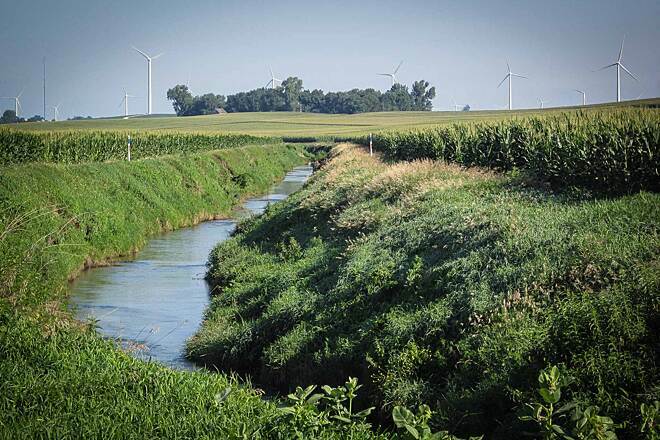 It was a peaceful, quiet ride thru corn fields and the beautiful country sides of rural Iowa. 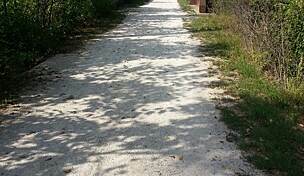 The trail is in great shape and is very smooth until you have to cross several gravel roads. Like others have said, bring extra hydration and snacks as there's not much along the way to stop. We rode the trail for the first time right after Labor Day. We average 10 mph so it took us slightly over 4 hrs round trip. Scenery, along with all the little wooden bridges was neat! Concrete is much easier to ride than the asphalt on the Caroll end. An unusual experience we encountered was a train completely stopped for 45 min across the gravel intersection. All we could do was stand and wait ( along with other bikers on the opposite side). And further along the trail we came upon some cattle that were not on the right side of the fence!! Fortunately they were more curious than vicious. Our last few miles back to Lake View we rode in an unforecast light rain. Overall, it was a good ride and we will be back. 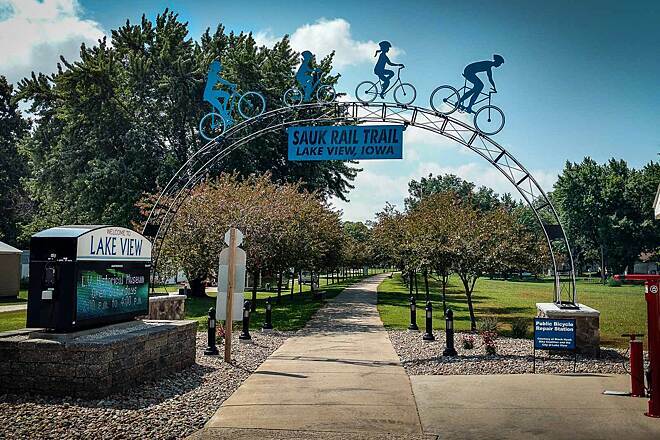 My husband and I rode the Sauk Rail Trail July 3, 2015 from Carroll to Lake View and back. Started about 8 am and ended in the afternoon. The trailhead at Carroll would rate about 1 star....it was one of the worst I've seen. Hard to find and nothing special. The other end at Lake View was great.....they made it very nice! 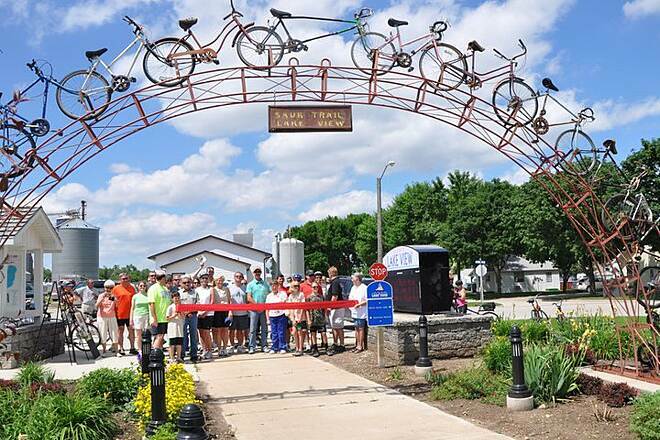 The bike arch is cool. We met "Doc" taking care of the trail. Alot of nice people on the trail. 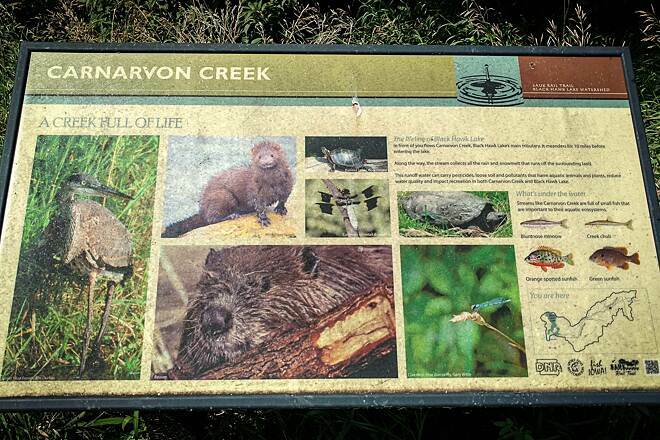 Nice nature trail and lots of things to look at ...birds, critters, plants, windmills. 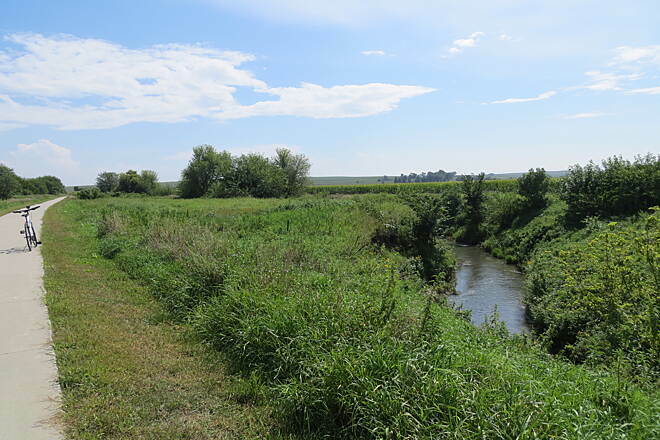 We rode this trail with my 9 year old son from Lake View to Swan Lake, south of Carroll, about 25 miles. We spent the night at the beautiful campground at Swan Lake ($10 fee for tent camping), and rode back the next morning. Perfect distance for a young rider and we loved all the windmills. Plenty of rest stops available and the trail is in perfect condition. Concrete for most of the way with a few miles asfault near Carroll. Daily fee of $2 per adult is well worth it. This trail is all hard surfaced. 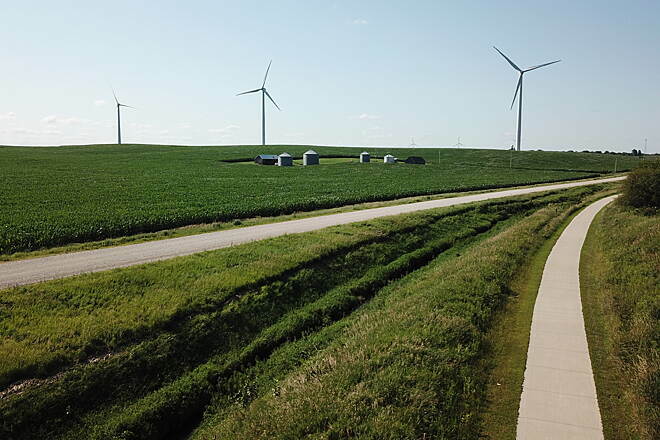 The trail will bring you close to gigantic wind mills, and through fields of prairie grass, corn, and soybean fields, as well as areas through trees. Bring suntan lotion for the open areas. The greatest distance to any town with services is 8 miles. 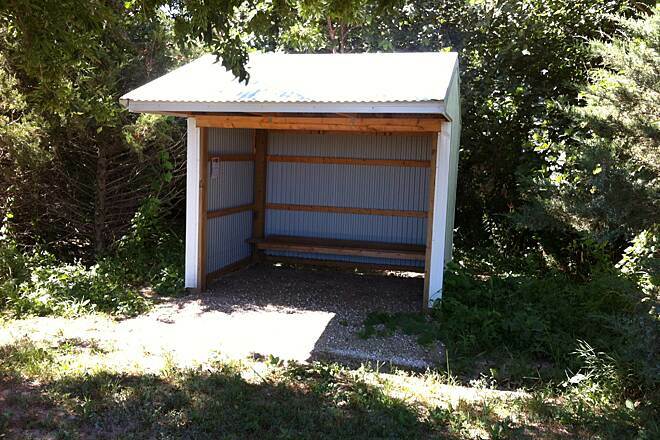 The shelters halfway between Carroll and Maple River and Maple River and Breda make nice rest areas as well. Camping or hotels are available at both ends of the trail at Carroll or Lake View. Awesome! The trail is great condition and very scenic. Love going through the wind farm. You must pack snacks and drinks, no where to stop along trail. I've only ridden this trail from Carroll to Breda but the scenery is amazing! You need to bring a $1 bill along which you deposit in one of the boxes as a charge for using the trail. 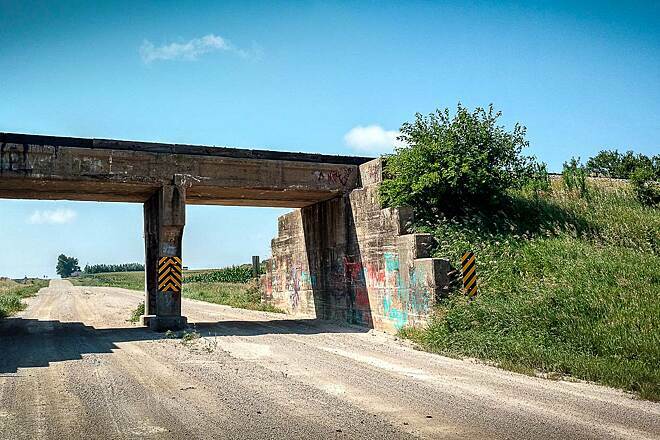 The trail is paved, the only downside for me was that there are no underpasses when you come to intersections and a lot of the roads that meet with the trail are gravel roads.... VERY hard to make across on a road bike with skinny little tires. It does slow you down to cross these. Other than that a great trail. Pack snacks, not much between the towns. This trail is now paved the whole length. This is a great and easy trail to ride. 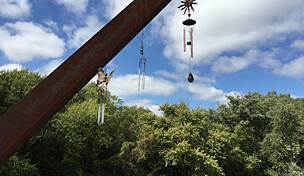 Some great stops along the trail include Trappers Den in Lake View, Carnarvon Inn in Carnarvon, Reds place in Breda and Little Gus's in Maple River. And of course Carroll has many great places to stop. 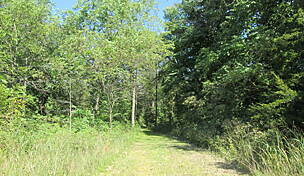 My husband and I rode the trail from Lake View to Breda and back Sept. 8, 2011. We spent the night in Carroll and rode from Carroll up to Breda and back on Sept. 9, 2011. The weather, scenery, and trail were awesome! This is the best trail we've been on so far. It was concrete and very flat, a nice easy ride for us sr. citizens! We would highly recomend this trail. Be sure to pack beverages and snacks. This is a very nice ride for all ages. The concrete trail is wonderful. Make sure you bring along drink/snack as this is not readily available. Sunscreen is a must if going during middle of day as there is not a lot of coverage. Rode the entire trail this weekend. It is pretty flat except around Swan Lake in Carol. No access to food on the trail though there are bars in the small towns along the trail. We stopped in Breda for a bite and could only find a convenience store that served fried foods. Don't get the homemade tenderloin it tastes like shoe leather. So in other words pack your own food. 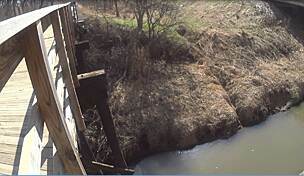 Nothing in Carroll is close to the trail. The Lake View side, Black Hawk Lake food is available in town. We stayed at Black Hawk Lake in the campground very nice campground. Pull thru sites are a bit close, but we were there to ride so didn't mind. It is a very scenic trail. 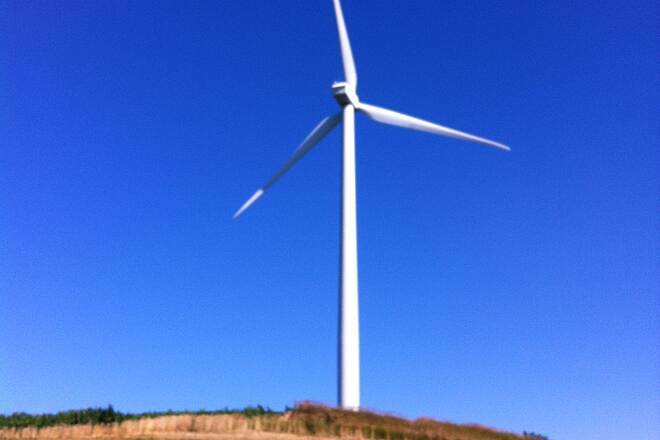 It takes your through a wind farm, which I thought was pretty cool. The Black Hawk side is newer and nicer, concrete trail. The Swan Lake side is Asphalt and older. A little work remains on the shoulders but the trail is now all pavement. A Great trail to ride! 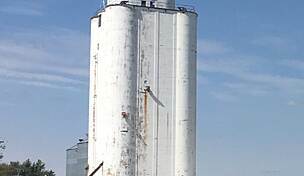 "True, it's not too challenging except for finding the southern trail head. There was one area in a valley that looked like a hill scene from Europe. Very beautiful. " "Very flat, and not very challenging riding, except that you have to keep working. Coasting is simply not an option. Very pretty one you reach the Hazelbrush area south of Breda. 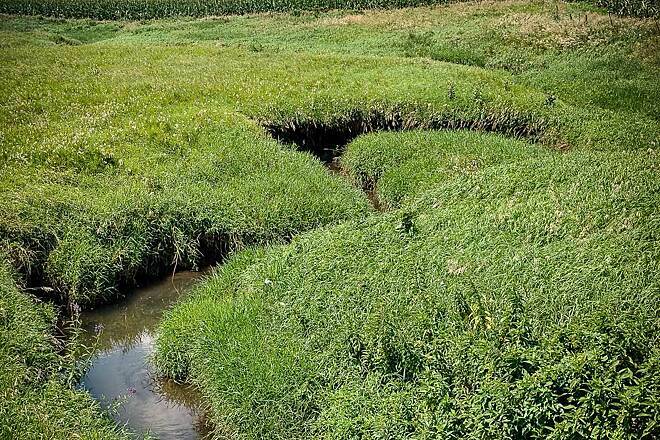 Worth a water break here to spot wildlife and just relax."